Take control of your phone camera. 1Shot gives you a choice of simple or advanced settings. 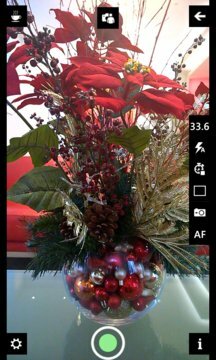 App includes a high resolution photo viewer and an option to apply various filters. Whether your phone sports a 41 mega pixel camera on Lumia 1020, 20 mega pixel Lumia 1520 / Verizon Icon / Lumia 930 or a 5 mega pixel camera on Lumia 520, 1Shot will work expose every available option. Best of all, images (including high resolution) are stored straight into camera roll and depending upon your OneDrive upload settings, you can get those saved straight to cloud. 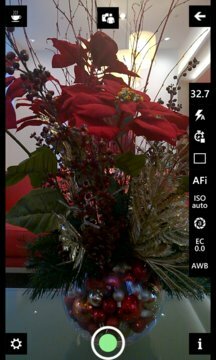 For those who like manual control, turn on Advanced Camera Options to access ISO, Shutter Speeds, Exposure Compensation and White Balance Presets.